The A330-200F utilizes the same airframe as its passenger counterpart, with the notable modification of its nose landing gear which is attached to the fuselage via a bulge. This is necessary in order to provide a level deck during loading, as the standard passenger model dips forward slightly whilst on the ground. 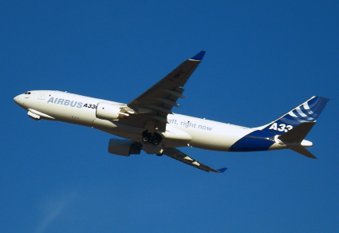 The A330-200F can carry 65 tonnes of cargo up to 4,000 nautical miles or 70 tonnes of cargo up to 3,200 nautical miles. As of early 2016, 33 A330-200Fs have been delivered and are primarily in use with Avianca Cargo and Qatar Airways Cargo.